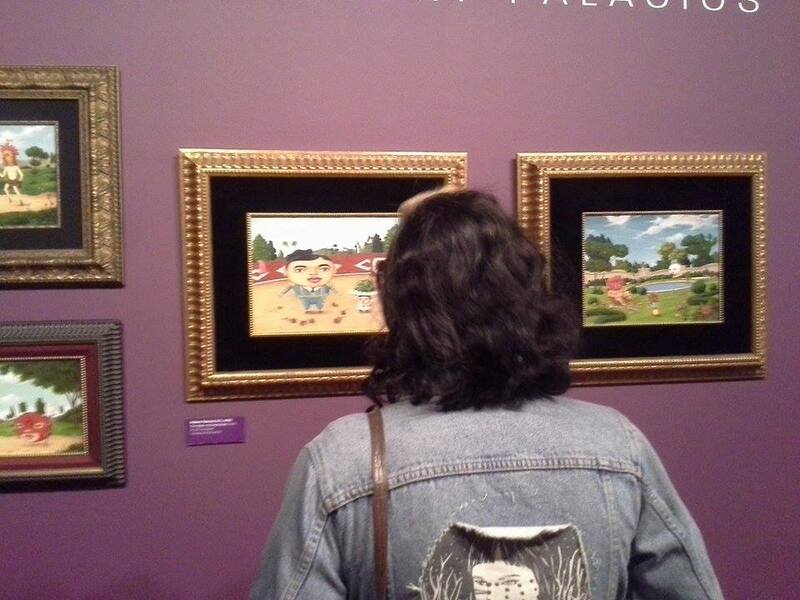 On Saturday January 30th, all museums in Los Angeles had free admission to the public, so I decided to roll through to MOLAA (Museum of Latin American Arts) in Long Beach. This museum focuses on Latin American Art from Los Angeles and beyond so I made a commitment to visit. MOLAA is unlike most museums that focus on Eurocentric images as it gives space to a Chicano/Latino narrative that is constantly underrepresented in the arts. I checked it out and I must say I was pretty satisfied seeing exhibitions full of Latino and Chicano artists –as a Chicana and an artist myself this definitevely stirred my emotions and inspiration. One of the main exhibitions was The River Paintings by Victor Hugo Zayas that narrates imagery of the Los Angeles River through a variety of different mediums and paintings. The images demonstrate topics of industrialization, environment, community space and human interaction. The images show various abstract perspectives that are either very chaotic or calming in their method and are up for interpretation to the viewer. The main message I got out of these images emphasized a lack of awareness about ways urban advancement has made us forget there is a river running straight through our city and that this river was the foundation that this city was built on. We are too busy stuck in traffic to look down the bridge, or too stuck in the pace of our modern society to step back and realize that water and our earth is what got this city running in the first place. Below is a video of the images and his explanation to this art. Another exhibition was Somewhere Over El Arco Iris: Chicano Landscapes 1971-2015, which showcases exclusively Southern California Chicano artists and their creations. Some images included large paintings of a woman in Dia de los Muertos makeup, sculptures of esqueletos sitting around a rowdy table and drinking, landscapes of our barrios, and the border between Mexico and the U.S. These images touched on topics I resonated with, like narratives of migration, urban violence in the hood, celebration of our holidays, a broken American Dream and various other things many Chicanos can relate to. I loved this exhibition the most because it inspired and encouraged me to be more intentional with my art. To use art to create consciousness and perspective amongst viewers which lives may not relate to this art as much as mine. Below is another video showing the images and a conversation of what it is about. This free museum day was the best one yet and I encourage you and your homies to check out MOLAA to see some dope representation of our local communities. And of course, always keep making arte. Awesome to see LA [email protected]/[email protected] works being represented MOLAA! Great improvement from several years ago.